In this Low-Carb Mediterranean Spaghetti Squash Sauteed with Vegetables and Feta, roasted spaghetti squash combines perfectly with mushrooms, zucchini, tomatoes, olives, artichoke hearts, and Feta! This delicious Low-Carb Mediterranean Spaghetti Squash is also Keto, gluten-free, low-glycemic, and South Beach Diet friendly; use the Diet-Type Index to find more recipes like this one. Click to PIN Low-Carb Mediterranean Spaghetti Squash Sauteed with Vegetables and Feta! Watch the video to see if you’d like to make Low-Carb Mediterranean Spaghetti Squash Sauteed with Vegetables and Feta! I think most bloggers would agree that one very fun thing about writing a blog is getting nice e-mails and comments from readers. And sometimes those very nice readers will send you recipes that you love and plan to make over and over, which makes the nice e-mails even better. This amazing recipe for Low-Carb Mediterranean Spaghetti Squash Sauteed with Vegetables and Feta came from a nice reader named Joyce. She described the recipe to me and said if it sounded like something I’d like to try she would take a stab at writing up the recipe, and oh boy, did I ever want to try it. Jake and I made this late in the afternoon on a long cooking day, making only a few minimal changes to Joyce’s recipe, and before the night was over I had polished off all my share of the leftovers! Even if you’re not wild about spaghetti squash, if you like the other flavors here I’m willing to bet you’ll like it as much as we did. 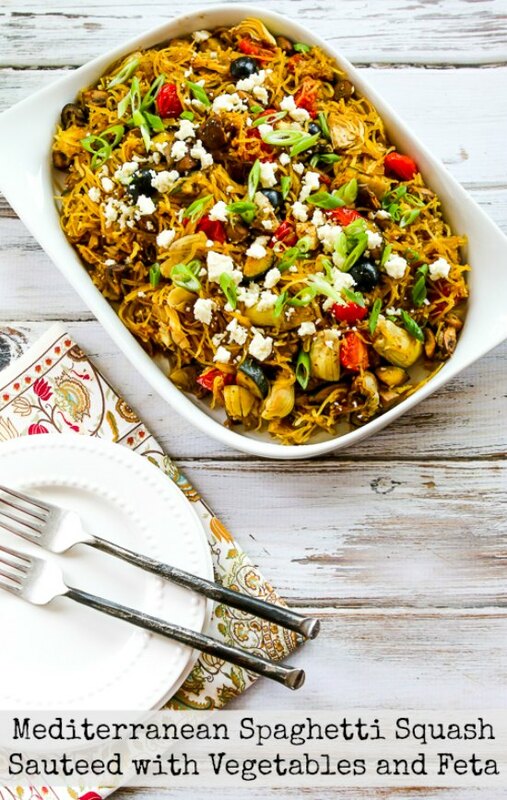 You really can’t go wrong with a dish that includes spaghetti squash, mushrooms, zucchini, tomatoes, olives, artichokes, balsamic vinegar, and Feta, and this is a Meatless Monday dish that’s low-carb, gluten-free, South Beach Diet Phase One, and it can be Paleo if you omit the cheese. But even with all those good credentials, I’m mostly urging you to try this recipe because it’s so amazingly delicious; thanks Joyce! Microwave squash, then cut into quarters lengthwise, brush with olive oil, sprinkle with Italian Herb Blend, and bake. (This takes about 45 minutes if you start it in the microwave. Cook the squash first and let it be cooling when you start cooking the other ingredients.) While the squash roasts, drain and cut up the artichoke hearts and cut cherry tomatoes and olives in half. (I used plain black olives but Kalamata olives would also be good.) Also cut up the mushrooms, onions, and zucchini, thinly slice the green onions, and crumble the Feta. (You’ll have to use your imagination for a photo of those!) When the squash is done and cooling, heat oil in a non-stick frying pan with high sides and saute mushrooms about 5 minutes, or until they’re browned and all the released liquid has been evaporated. Remove the mushrooms, add a tiny bit more oil if needed, heat the oil and then saute the onions and zucchini about 5 minutes. Add the Italian Herb Blend and dried oregano and cook a minute or so longer. Mix 1/2 cup chicken stock with 2 tablespoons balsamic or sherry vinegar. Add the stock-vinegar mixture to the pan and cook over medium heat about 2 minutes, then add mushroom back into the pan. Add the tomatoes, olives, and artichoke hearts and cook about 2 minutes more. While those vegetables are getting warmed, shred the spaghetti squash apart with a fork. Add the spaghetti squash to the pan and gently toss with the other ingredients, then toss in part of the Feta. Season to taste with salt and fresh-ground black pepper and serve hot, with additional Feta and sliced green onions sprinkled over the top. In this Low-Carb Mediterranean Spaghetti Squash Sauteed with Vegetables and Feta, roasted spaghetti squash combines perfectly with mushrooms, zucchini, tomatoes, olives, artichoke hearts, and Feta! Cut squash into four lengthwise pieces, scrape away seeds and discard, brush the surface with olive oil, and sprinkle with Italian Herb Blend. Let squash cool until you can handle it. While squash roasts, drain and cut up artichoke hearts, cut cherry tomatoes and olives in half, cut up the mushrooms, onions, and zucchini, thinly slice the green onions, and crumble the Feta. Mix the stock with the vinegar. You want all these ingredients prepared when you start to saute. Saute mushrooms over medium-high heat until they’re browned and all the liquid has evaporated. Remove mushrooms to a plate. Add 2 tsp. more olive oil and heat, then saute the onions and zucchini about 5 minutes, until they’re starting to get lightly brown. Add the minced garlic and Italian herb blend and cook about 2 minutes more. Pour in the stock/vinegar mixture, turn heat to medium, and cook about 2 minutes, then add mushrooms back to the pan. As soon as it’s cool enough to handle (probably while the onions and zucchini are cooking) shred the spaghetti squash flesh apart with a fork and discard the skin. When all vegetables are heated, gently mix in the spaghetti squash. Then mix in the 3/4 cup of Feta. Arrange on a serving dish and sprinkle with the remaining Feta and sliced green onions. I ate all mine the same day I cooked it, so I don’t know how well this will keep in the fridge, but I’m guessing it would be okay after a day and could be reheated in a microwave or hot frying pan. Recipe from a reader named Joyce with very slight adaptations by Kalyn. Spaghetti squash is a wonderfully low-glycemic and low-carb ingredient, and this Low-Carb Mediterranean Spaghetti Squash Sauteed with Vegetables and Feta would be approved for all phases of the South Beach Diet and other low-carb diet plans. I’m Joyce, and I always get a giggle when I return to your website for the recipe I sent you in the first place, which you tuned up to make it shareable. I’m making this tomorrow. Hi Joyce, so fun to hear from you! This is still one of my favorites too! I’m so glad I sent you this recipe! I haven’t made it in quite awhile, and didn’t remember all the details, but I knew I could find it on your site. My most recent ‘experiment’ was with a puffball that my cousin gifted me. If you aren’t familiar with puffballs, they are a large, edible fungus, like a mushroom, but without any gills. They look like a softball, or a soccer ball, and usually grow in fields where trees used to grow. When you cut it open, a puffball should be perfectly white inside, with no gills. You use it as you would mushrooms, and I’m going to use some with my spaghetti squash for dinner tonite. Much like tofu, it takes on the flavors of whatever you cook with it. As a side dish, and another ‘experiment’, I’ll make a bit of puffball parmigiana. I’ve got to get rid of this puffball….it’s taking up half my fridge! Anyway, I appreciate that I could come back to your site and find the recipe again. Thanks again for sharing the recipe Joyce! I haven’t heard of puffballs, maybe they don’t grow around here where it’s so dry! Sounds interesting though. Just made this and it was excellent! Didn't look quite as nice as the picture, and I messed up the timing of the veggies a bit. I like the above idea of roasting for next time. But the taste was unbelievable…. great idea! Made this tonight, first time having spaghetti squash. Everything tasted great. Yum! This looks wonderful, can't wait to give it a try! Thanks Kate, hope you enjoy! This looks so delicious…I definitely need to try it. I wish it was spaghetti squash season! Pam I think you can get them all winter in most places, but not as cheap as in the fall! This looks so delicious, I have to try it! Spaghetti squash is a favorite of mine, but with the addition of all these delectable flavors I'm sure will make it irresistible. Thank you! Thanks Deanie; hope you enjoy it! Mamier, glad you liked it, and I love the idea of roasting the mushrooms, and maybe the zucchini as well! This was a tasty recipe that made many leftovers for my family. It was a bit time consuming, even though I roasted the squash whole, earlier in the day. I will make it again when I have time 🙂 and I might roast the mushrooms while roasting the squash. Thanks for sharing! Barbara, I think there are endless ways to vary the veggies in this! This looks amazing, although I might leave the zucchini out. I need a zucchini break, LOL! Thanks Becky, such a great recipe from Joyce! 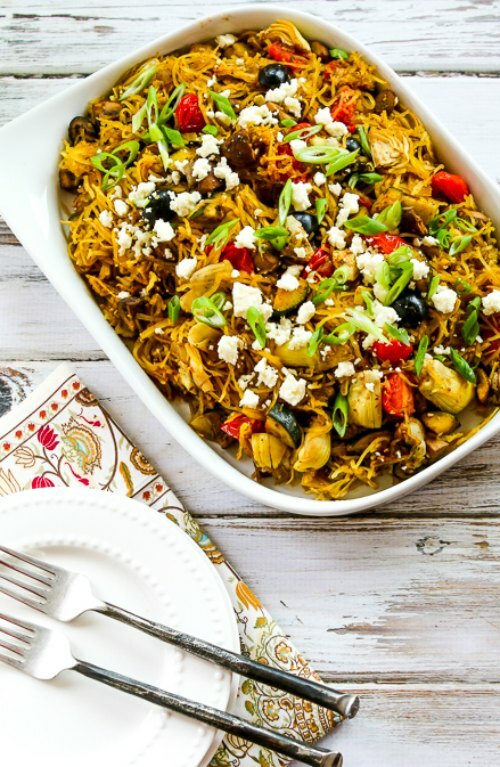 Great idea to throw in mediterranean flavors in with spaghetti squash! Joyce, you deserve more than 15 minutes for this fantastic recipe. We absolutely loved it! Anna, I think Greek seasoning would be great, so glad you enjoyed it! Very, very, good flavours. I can't say I followed the directions to a T (i.e. not everything was sauteed separately; lazy cook here)but it was really the first spaghetti squash recipe I would repeat. Thank you! Oh, and I used a Greek seasoning blend instead of the Italian; not sure how much difference it made but I had it on hand. Kalyn, I'm tickled to death that you chose to post my recipe! You provided much more detail than I gave you, which will help your readers achieve success. It's really yummy, and super healthy too. I just want to mention that there is plenty of room for experimentation with this….add any herbs or spices you like, or veggies that yield themselves to sauteing. I think this is my 15 minutes of fame! Joanne, Lydia, and Hari, so glad to hear you guys see the appeal in this. Jake and I loved it! What a gift to get this great recipe from a reader! I love everything about it. These days, I'd probably cook the squash in my pressure cooker, which makes it very fast. Reader feedback is definitely the best, especially when it yields recipes like this! I love all the Mediterranean mixins!